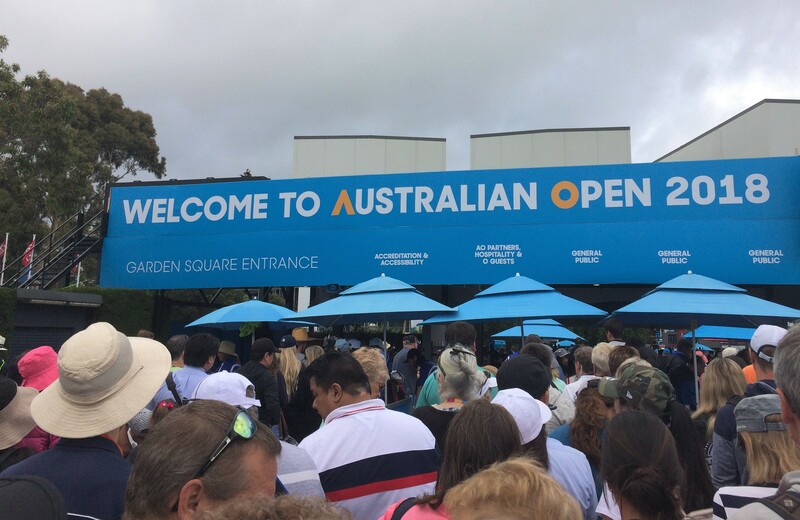 This is the final post from my trip to Australia with a review of the fan experience from the Australian Open. I really hope that this post will be informative for anyone that may be planning to go for it in the future. There’s plenty of tips about buying tickets, what to take/not to take, the courts, food and drink and plenty more! I’d be very happy to answer any questions you may have (see details at the bottom of this post). If you’ve missed any of my reports from the four days, click on the links below. Enjoy! The hardest thing about buying tickets for the Australian Open was choosing what to go for! Compared to the French Open and Wimbledon, it’s very straightforward and mostly hassle-free. Getting tickets for Wimbledon seems to get harder each year unless you are willing to camp/queue. Purchasing tickets for the Australian Open is very similar to the US Open. We chose a mix of tickets across all stadiums and at day and night. My brother and I love the first few days at Wimbledon on the outside courts so we were happy with just a ground pass on the Tuesday. In hindsight, four days felt one too many as we were pooped by the final day although this was probably down to the weather on our last day. It would have been nice to have an extra day to explore Melbourne. Australian Open tickets for 2018 were released online at 11pm (UK time) on the 9th of October, 2017. My advice if you are buying tickets in the future is to go in with an exact plan of what you want. All the ticket prices and stadium plans are up on the Australian Open website so you can make your plans before the tickets are released. The only issue is that you cannot choose your individual seats so you may have to do some waiting around if you want to be in a particular area of a stadium. One tip if you are buying multiple sets of tickets is that after choosing one set of tickets, go back to the homepage and find your next set as there is a fee associated with each purchase. 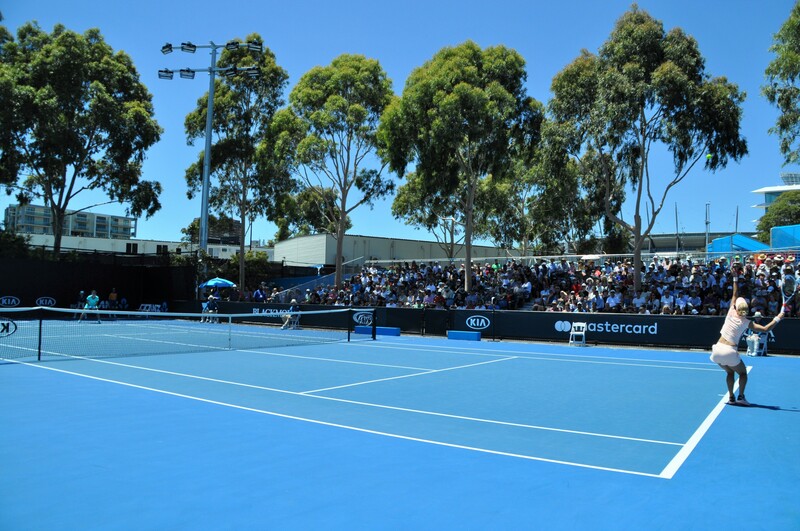 Details for buying tickets can be found on the Australian Open website. Tickets can be purchased on Ticketek website in early October. We opted to stay in East Melbourne so didn’t use public transport to get to the venue. It was refreshing to be able to walk to the grounds and it was also cheaper a bit further out of the city. We took a few detours on the way to the tennis to explore the city. Out of all the Slams, the Australian Open is the closest to the city. Public transport is excellent and the trams from Melbourne CBD to the tennis are free (more details HERE). The nearest train station is Jolimont which we frequently walked past on our way to the tennis and is a ten minute walk from the venue. Alternatively, you can always walk from Flinders Street station, through Federation Square, and along the Yarra river to the tennis. Our quickest route from the hotel went past Jolimont station, Melbourne Cricket Ground and across the Emirates Skydeck. We entered the grounds through two of the entrances – Garden Square (north of the grounds and adjacent to Rod Laver Arena tram stop) and Grand Slam Oval (south of the grounds on Olympic Boulevard). The gates always opened at 10am and we were there early on the first day at Garden Square where we were met with a pretty long queue! After this we always arrived after 10, closer to 10:30, and didn’t have to wait longer than five minutess to go through security. The restrictions on what to take into the grounds are similar to Wimbledon. You are allowed to take in a rucksack and food and drink seems mostly fine although no alcohol. After the first day we took a lot more food in and this was all fine with no problems going through security. For cameras, the limit on lenses is 200mm which was fine for me as I took my 20-200mm lens. They did actually check my camera on a few occasions so be careful if you try to take anything bigger in. It’s worth checking the list on the AO website beforehand. First thoughts on the AO grounds were a big thumbs up. It feels vast and spacious. It does take some time to get from one end of the grounds to the other so you’ll do plenty of walking! It definitely felt like the biggest grounds of any of the four Slams. A plan is provided below from the AO website. While the grounds did feel mostly spacious, the area around Rod Laver Arena (RLA), MCA and Show Court 3 can get very congested at times. The increase in people is noticeable around 5pm when the crowds for the RLA and MCA night sessions start to arrive. On the second day the people and queues got to me. There is public wi-fi in the grounds although I only got it to work in RLA and MCA. There are plenty of toilets dotted all around the grounds and it was easily the best of all the Slams for facilities, particularly around RLA and MCA. There are plenty of places to sit down and chill around the grounds. I really liked the steps outside of the main entrance of RLA on the north side, overlooking Show Court 3. This was a handy place to sit down, cool off and eat. One negative of the grounds was getting from the west side of MCA and Show Court 2 to the outside courts in the north-west corner of the grounds. We couldn’t find a shortcut so ended up having to walk all the way around from the entrance at Tanderrum bridge, past MCA, turning left past Show Court 3 (on your right) and then to the outside courts. We had four tickets on RLA with two day sessions and two night sessions. For three of the sessions we went for Category 3 where we were about midway up on the upper tier (Rows K and L). For the last day, we pushed the boat out and went for Category 2 where we were lucky enough to get side on tickets that were 15 rows from the front (Section 5, Row O). Our best seats were on the hot day when temperatures were approaching 40C. We were fortunate to have no-one in front of us so the view was great. I did find that whenever there was someone sat in front of me on RLA that my view was obstructed. I wish I was taller! A mistake on our part was getting tickets in the sun. I wish I’d paid more attention when buying tickets. The AO website clearly marks HERE the seats that are exposed to direct sunlight. For reference, for lower tier seats, the west stand (doors 4-7) is in the sun at the start of the play and shades over in the afternoon. The east stand (doors 14-17) is almost all in the sun by 11:30am and it just gets brighter during the day. If you want to top up your tan then this is the place to do! Otherwise, I would suggest avoiding these areas. Entry into RLA is all on one level with no distinction between lower and upper tier. There are a few steps to climb to get to the door entrances but it did mean that the areas inside the stadium did tend to get very busy. Getting back to your seats in the upper tier after a comfort break was a bit of a dash in a standard changeover! The seats in the upper tier were perfectly adequate. It was difficult to get decent pictures with my 20-200mm lens but the view was just fine. It was a far cry from the upper tier of the Arthur Ashe Stadium where you feel in the gods and rather detached from the tennis. I thought the atmosphere on RLA was great and we were lucky to see some quality matches that the crowd were highly engaged in. All in all, a solid thumbs up for RLA. If you can hack the sun, i’d definitely recommend the Category 2 lower tier seats. Otherwise push the boat out for Category 1 or go for Category 2 seats in the upper tier. We had one session in MCA and went for the cheap tickets in Category 3 (Section 28, Row C). For details of the seating on MCA check out the website HERE. Unlike RLA, there are some stairs to go up for the upper tier and then you open the door for your designated entry – slightly odd! (see below). 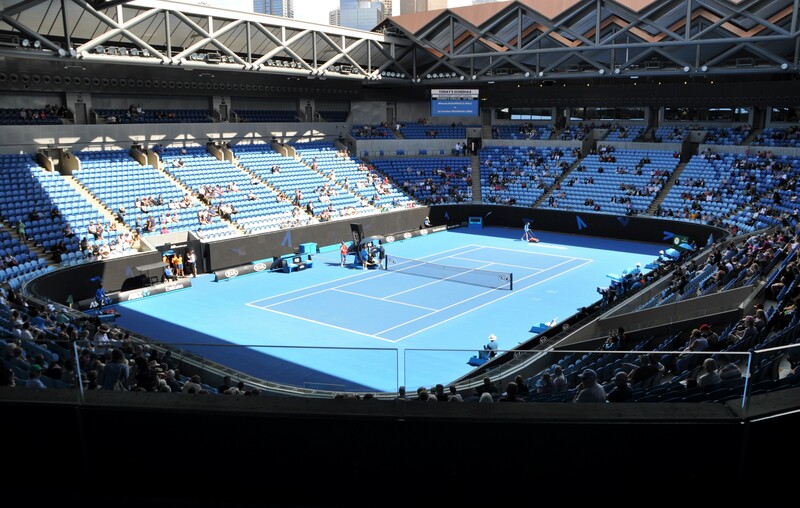 The redevelopment of MCA was complete for the 2015 Australian Open and unsurprisingly, it’s the most modern of all the stadiums. I don’t think there is a bad seat to watch tennis. The seats are very comfortable with plenty of leg room. My only gripe was the glass barrier at the front of the upper tier. Sitting up straight was just about good enough from row C seats to avoid being blocked (see below). I would probably avoid the front few rows for this reason. Most of the court was shaded and we weren’t in the sun at all from our position. A big thumbs up for MCA in terms of watching tennis. If you want to save money, I think category 3 tickets are perfectly adequate. Aside from two rows of reserved seating directly behind the players, the Hisense arena is general admission seating for ground pass holders. We only watched one match on Hisense and this was partly being put off by the crowds. Hisense has a re-entry ticket policy – when you leave your seat you can get a re-entry ticket from a member of staff that allows you back in within 90 minutes (not 100% sure on the time!). When the doors open at each changeover, the people with re-entry tickets have priority and go in first. This was a pain getting in for the first time because on the occasion we tried, there was not enough time on the changeover to find a seat. It was a struggle with the sheer volume of people exiting and seats being held. It kind of spoiled the Hisense experience for us which was a shame because it is a stunning venue. The view from the upper tier was excellent. The seating is steeply inclined which means you have a clear view and are not obstructed at all by the person’s head in front of you like RLA. There is also plenty of leg room! I loved this court. There’s a nice view of the city from the south stand. Many of the seats at the back of the court have a canopy over them that is great for avoiding the sun. There are the odd seats that are blocked by poles holding them up but nothing major. We never had a problem getting a seat on Show Court 2. I did struggle to get back into the court once after I left my seat as a big queue emerged and I felt naught trying to barge in. Note there are no re-entry tickets like on Hisense although my brother read somewhere that you can leave your seat and come back within three changeovers. In the end, my brother came out after I wimped out trying to get back in and we moved on somewhere else 😂. Show Court 3 is the same capacity as Show Court 2 with 3,000 seats and all for ground pass holders. This was great when compared to Wimbledon’s Court 2 and Court 3 where only the latter has half capacity for ground pass holders. I watched Lucie twice on this court and both experiences were positive. I particularly liked the artwork surrounding Show Court 3 – something different! We did find this court had big queues at times, perhaps due to its more central location next to RLA. Show Court 2 is a bit more hidden on one side of MCA and therefore, not in the main thoroughfare. 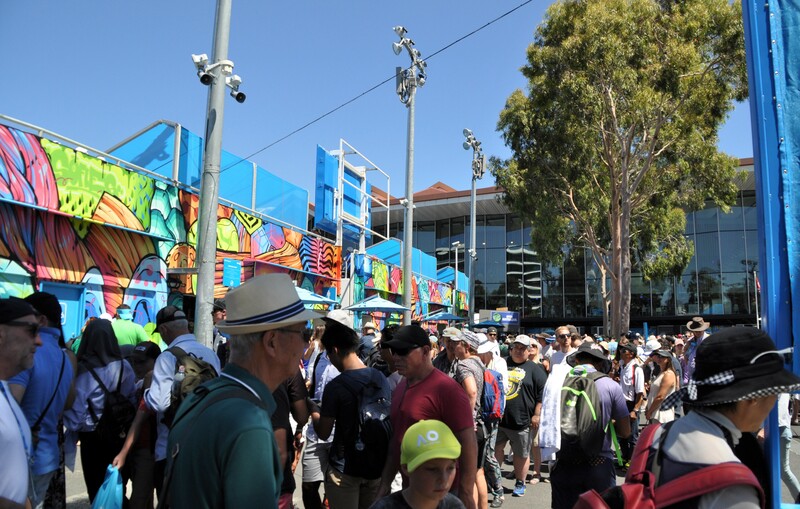 There were massive queues prior to Kokkinakis’s first round match against Medvedev on day 2. Scheduling this match late on Show Court 3 was a tad ludicrous IMO although I’m not sure where else they could have put it. Of the outside courts at the Australian Open I think this was my favourite. There are a trio of towering trees planted within the lone stand and it’s a lovely setting. The ballkids and linejudges kept having to remove all the leaves that fell onto the court! We watched Vesnina-Jabeur, just standing by the side. It was fab to get so close to the action. There are two stands for Court 8 and we were in the western stand for Kontaveit vs. Barthel which is shaded from the sun. We ended moving three times for a better view, failing on all three occasions! There were metal bars and poles constantly in our way. Not the best court for a view but it does provide shade so you can’t really complain. The east stand was much bigger and would likely have had a clearer view. Court 8 attracted some decent names and seemed to be busy most times we walked past. You’d often get a gathering of people in the corner, looking into the action. Goodness knows why as they wouldn’t have been able to see much! Court 10 had one small stand with two rows of seats but otherwise was just standing view. This was generally one of the quietest courts. I found it easy to get to the front on the sidelines during various women’s matches. One random note – I wish the metal railings weren’t coloured black as they were hot to touch! There is a decent sized stand on the west side with a nice view over the grounds. It’s a pretty good view although we were on this court late in the day so didn’t have anyone in front us blocking our view. Tucked into the North West corner of the grounds, we watched Dasha squared doubles on Court 14 and Bertens-Bellis on court 15 on the first day. Both courts have one main stand on the west side of the court. Like Court 8, it was hard to get a clear view of the court but you get shade! 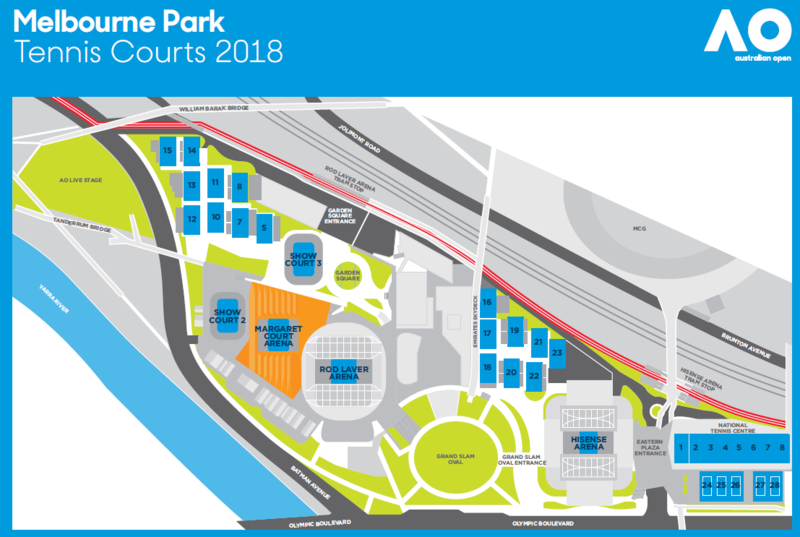 These courts are located on the East side of the grounds near Hisense arena. Courts 16, 17, 18, 21 and 23 seemed to be used exclusively for practice. Court 18 was my favourite and we never have a problem getting a clear view of practises and right to the front – we saw Petra Kvitova, Anett Kontaveit and Olivia Rogowska on this court. I like that they had a screen up for each court which displayed a timetable of who was practising at what time (see below). Watching practises are important to me as it’s something unique for visiting a tennis tournament as most match courts are now streamed. Generally I thought watching players practice at the AO was good and easily the second best Slam for access. On the Wednesday, high profile players were scheduled on Courts 16 and 17. Access on the ground was pretty tricky but another option is to walk along the Emirates Skydeck and get a nice view overlooking the courts. We managed to do this early morning for Maria Sharapova and Rafael Nadal. I guess later in the day this may have been more difficult! On the map you’ll notice courts 24 to 28 in the far east corner of the stadium next to Hisense and the Eastern Plaza Entrance. We couldn’t work out how to get to these although I did hear later in the week that you can access them. Sadly we didn’t get around to exploring! After the first day when we realised that you could take food in, we brought sandwiches and snacks in every day. We had dinner on the Tuesday and Wednesday so got to try out the food. There are plenty options in the grounds and we bought food around RLA and MCA. If you’re looking for something healthy in the grounds then you might be disappointed. We tried various fast food options – fish and chips, calamari and chips and spicy southern fried chicken and chips. You notice a pattern! We mixed and matched with our fish and calamari which was tasty (see below). I’m not a massive fast food fan anymore but we were after something quick so we could get back to watching tennis. Everything was adequate and prices ranged between $12 and $16 Australian Dollars for one basket. There are many food and drink stands around Grand Slam Oval on the eastern side of the ground with an area representing each Slam. We wandered around this area once and it was super busy – there were people everywhere! We were there for the tennis so didn’t spend long here. One request I have is for more ice cream stalls! One of the few was a Haagen Daaz Bar by Court 7. There were frequently huge queues and they seemed to have problems accepting cards on one day. We eventually managed to get some ice cream during one of the night sessions when the grounds were much quieter. Alcoholic drinks were respectably priced and we had one or two during our night sessions. I was disappointed there wasn’t a special AO drink – I always look forward to a Pimms at Wimbledon and really enjoyed the Grey Goose Honey Deuce cocktail at the US Open. There are several small shops in RLA and MCA and two bigger stores – one near Grand Slam Oval and one on the north side of MCA adjacent to Show Court 3. There’s often a queue for the latter but if you are there for a few days, you’ll likely find a time when it’s quiet. It’s nice that they don’t let the shop get too full. I’m not sure I will ever be back so I had to get a cap and a shirt. 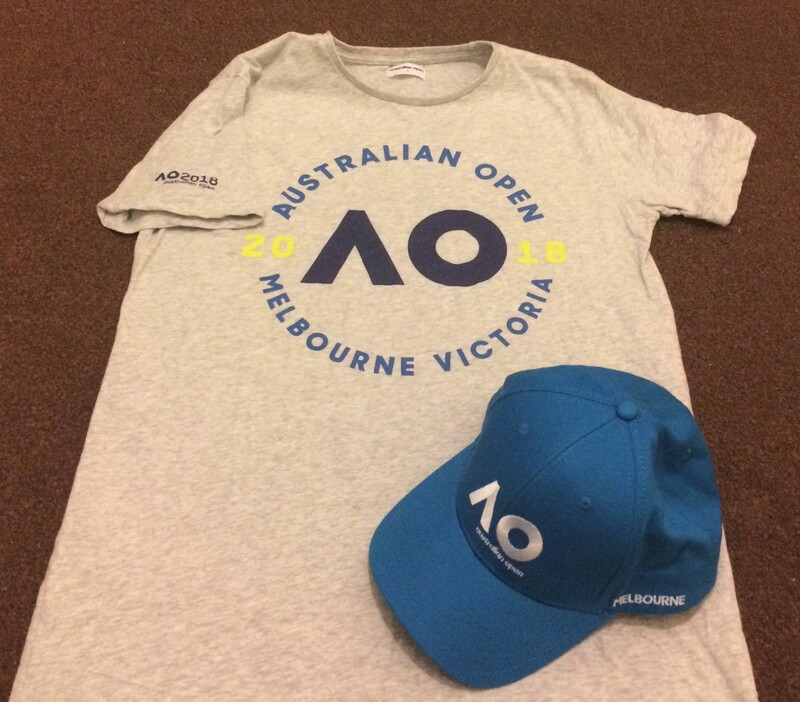 I want to do my Slam of caps – I’ve got US and AO, but still need a Wimby and French Open one! Prices were expensive but heyyy, I expected nothing less. I also bought a pair of fridge magnets, one for me and one for my Gran. It’s one of my goals in life to cover my Gran’s fridge door with magnets from my travels 😊. During our trip the weather got progressively hotter every day and the heat was brutal on the Thursday. The tournament though is well equipped for the heat. There are many water fountains dotted around the ground, particularly on the outside courts, where you can fill up water bottles. There was one station next to RLA that got very busy but otherwise, there were rarely big queues. There’s also quite a lot of shade on the outside courts and around the grounds. I liked the spray mist fans as you can see below 😂😂😂. 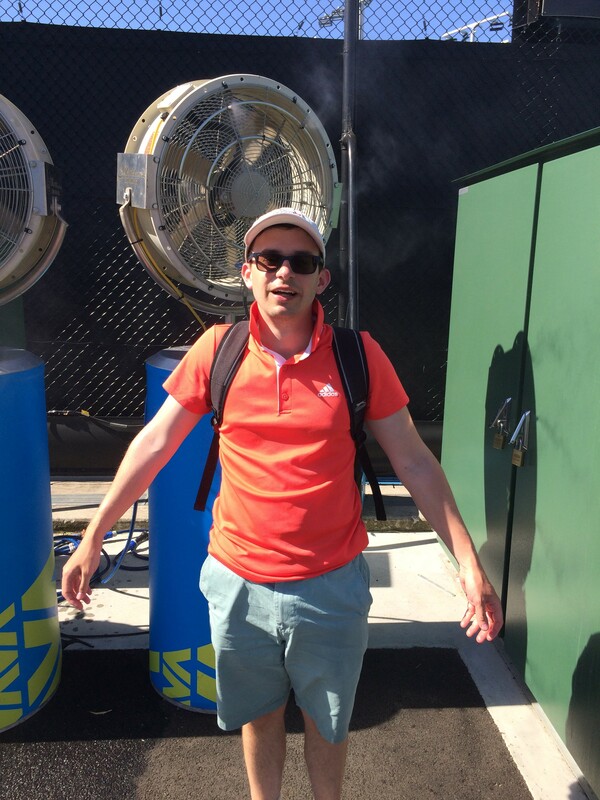 Despite the heat, I never actually got burnt at the AO – I was lathering on the suncream! My brother found sitting on a towel quite successful and we started using a mini solar fan on the final day. I am thrilled to have made it to the Australian Open and this trip was incredible – so many memories that I will never forget! We were absolutely euphoric on the first day but I think this dissipated a tad during the week with the crowds, queues and weather. 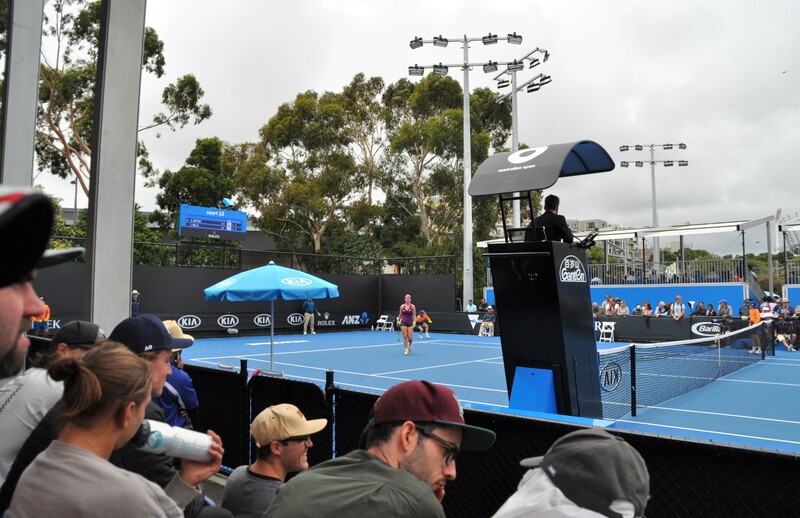 The access to courts and practices, compared to all four slams, was really good and everyone was so friendly – I can definitely see why the Australian Open is known as the Happy Slam! I think the biggest plus of our AO trip was the quality of the tennis. 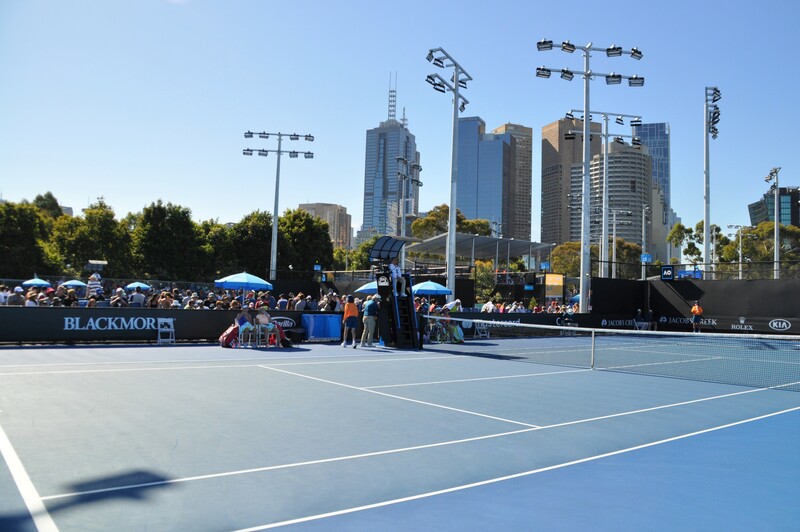 We saw so many great matches and that really helped create a buzz on the courts. I still believe that the opening – in arenas with retractable roofs – should be covered with retractable 50% sunlight reducing nets. Whammy #1— Reduce the heat on the court, which would greatly help the players. Whammy #3— Reduced sunlight intensity would make it easier for players to see the ball while serving. Whammy #4— Reduce the contrast intensity between sunlight and shade, which would make seeing the ball easier for both the TV viewers and the players. The net, similar to camouflage net, should be retractable for cloudy days. I’m planning a trip for 2019 now, and your coverage and detail are fantastic – just what I was hoping to find. Thanks so much for taking the time to share this! So glad that you found it useful, Rich!